Located on the western coast of Cornwall, the town of Tintagel and the castle ruins are way off the main highway and yet this is one of the most visited spots in Britain. The setting is magnificent and enchanting—right on the coast, with a waterfall, sea cave, and ancient ruins—is a magical place for the legend of King Arthur, the Knights of the Roundtable, Guinevere and Merlin the magician. The castle ruins date from the 13th century; although there are ruins from an earlier castle, constructed by Reginald, son of King Henry I in 1145. The main castle was built in 1233, by Richard, 1st Earl of Cornwall and Knight of the Holy Roman Empire. The connection of King Arthur to Tintagel is based on the writings of 12thcentury Welsh writer Geoffrey of Monmouth. Cornwall and Tintagel also figure into the tragic love story of Tristan and Isolde, a Romeo and Juliet-type story intertwined with the time of King Arthur, and about the warring kings of Ireland and England. Looking east from Tintagel Island ruins (near center) to the mainland castle ruins (far center). Town of Tintagel in distance (upper left). It’s about a 10-15 minute walk down to the castle setting and shoreline from the town. There is a boardwalk along the cliffs to the castle ruins on both the mainland and island (essentially part of the shoreline). The island is accessible via steep stairs cut into the rock. Unfortunately the castle is very ruined, with just a few walls remaining. On the bluff above the castle, there are some additional ruins and good coastline views. Directly across from the island outcrop, on the mainland are a few other castle ruins, also reached by a set of steep stairs. The castle buildings on both sides used to be connected by a narrow rock way which eroded centuries ago. Directly below the castle on the island is “Merlin’s Cave” accessible at low tide. Tintagel is one of the many sites in England that is part of the English Heritage governing board of historical properties. A ticket to the site costs £5.50. A yearly pass to all 400 sites that are part of English Heritage costs £46 per person, a good deal if you are visiting several historic sites. Check out the English Heritage website. 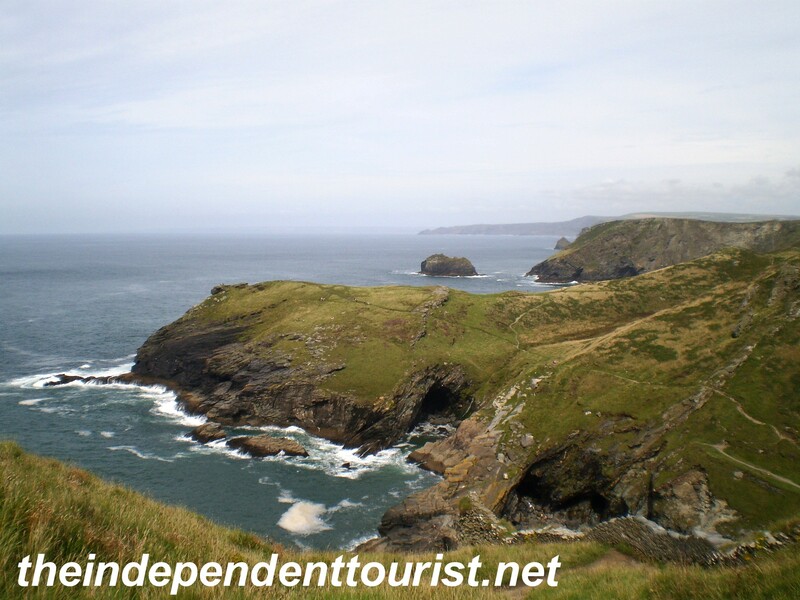 If you have an interest in King Arthur, castles or very enchanting locations, go to Tintagel. Posted in England and tagged Cornwall England, England Travel, Tintagel Castle on January 18, 2012 by Paul Terry.